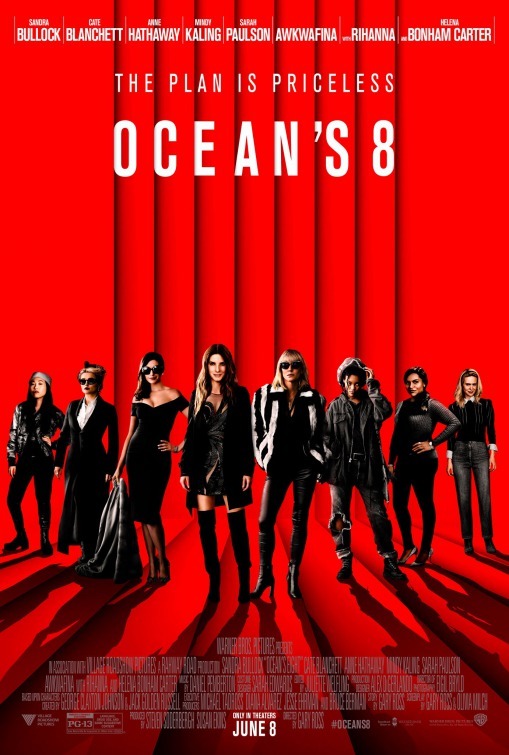 In Ocean’s Eight, Debbie Ocean (Sandra Bullock, The Blind Side, Gravity, Speed), the sister of series protagonist Danny Ocean, takes the lead and assembles an all female team with the help of biker girlfriend Lou (Cate Blanchett, Blue Jasmine, Carol, Lord of the Rings trilogy). Their relationship hints at being romantic, but unfolds more as deep intimacy. The romance never quite makes it onto the screen. Debbie, for example, is directed to her own room by Lou’s in her sprawling renovated warehouse apartment. Debbie and Lou’s team includes an eclectic mix of personalities, all of whom play logical and critical roles. Lou, for example, runs a successful bar and dance club. This puts in the position of being the chief administrator and human resource manager for the gang. The gang includes Tammy, a suburban mom (Sarah Paulson, 12 Years a Slave, The Post), a young Asian skater who can grift with the best (Awkwafina, Neighbors 2: Sorority Rising, Dude), an equally young computer hacker (singer Rihanna, Valerian, Battleship), a jewel expert (Mindy Kaling, The Mindy Project, The Office), among others. Anne Hathaway‘s (The Dark Knight Rises, The Intern, Les Miserables) turn as the seemingly vain and empty-headed celebrity Daphne Kluger is excellent. The film also includes scores of cameos by well known and less well known celebrities. However, don’t expect deep thinking or ideas. No one seems to be too worried about the size and scale of the heist, after all the only people losing are rich people and corporations. A revenge sub-plot maintains some tension throughout the movie, but the eye-for-eye justice is never questioned. Unfortunately, the plot is so straightforward that mentioning much of it creates spoilers. 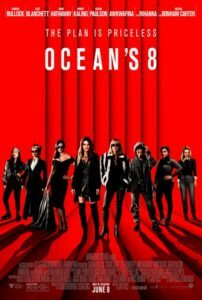 Nevertheless, as a purely escapist summer movie, Ocean’s Eight can work well. Just focus on the production and acting, and don’t look for too much more. My rubric brought the film in at an 8.1, but the movie entertains at a higher level. The low score really comes form the poor social message–robbing the right people for the right things is okay–and the plodding plot. My score seems to square with reviewers at Rotten Tomatoes, and their scores can be found here. Metacritic’s scores can be found here.